Many business owners that deliver equipment and products around the country needed a solution to replace some of aging small cab but heavy capability trucks on the road. Chevrolet has come up with the solution that’s right for these businesses in a vehicle that can be as flexible as needed. This new solution is the Low Cab Forward truck and it is perfect for what businesses need in order to have delivery option they want. This new truck has already been delivered to one company and they have put it right to work for their needs. 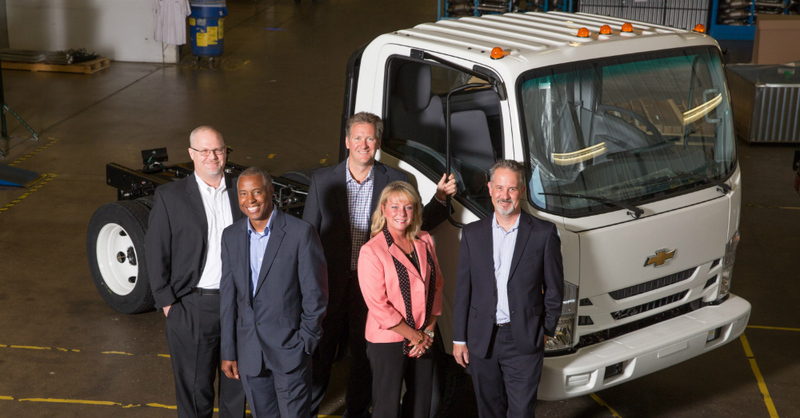 The first company to take delivery of the Low Cab Forward truck is Harmony Outdoor Power Equipment in Auburn, IN. This company has put it to work and claims it has already made their entire organization more efficient. This company chose the diesel powertrain and put on a custom bed and ramp to make the delivery of heavy outdoor equipment more efficient. With over 5,000 miles on the road already, the driver raves about this new truck and the company is already seeing the investment pay off, making this one of the most important decisions that Harmony has made for this year. This new truck comes in two forms. The diesel engine starts at a price of $48,375 while the gasoline version begins the pricing at $40,900. Right now the Low Cab Forward truck is being sold across the country at over 250 locations. This truck is only one of many that make up the Chevrolet fleet and is designed to help fleet managers know they have the truck that’s right for them on the road. Every sales team that sells this truck and any other fleet vehicles have gone through rigorous training to make sure they’re prepared to solve the fleet needs of a variety of small business owners. Not only is this a fantastic new fleet solution offered by Chevrolet, the new commercial lease program makes it even easier to make this the right investment. GM now offers a program called Right TRAC which can significantly lower monthly payments without charging for excess mileage or wear-and-tear charges. This is another great way for any business, including Harmony to save money on a monthly basis and have the fleet solution they’re looking for. This financing is the right way for many small businesses to know they’re going to have a continuous supply of these trucks for their delivery needs. Chevrolet continues to solve the fleet needs of those companies that have to get their products to the customers on a daily basis. With this new Low Cab Forward truck from Chevrolet any company could have the right vehicle for the delivery needs they have. This truck can be equipped with the right items for every company to have the delivery vehicle they’re looking for in order to enjoy the right balance between custom tooling and standard capability and efficiency on the road. This new truck is going to solve many fleet needs over the next several years.